You’ve prepared your content, created your slides, and practiced your presentation. You show up early and head to the presentation space with the hopes of getting everything set up with a few minutes left to settle in and relax prior to delivering your big presentation. You walk in to the room and discover you are lacking the cord needed to connect your laptop to the screen. Panic sets in and all of a sudden you are left frantically scouring the office for the right adapters. This is just one of the many scenarios presenters face when it comes to technology snafus. The bad news: technology mistakes will reflect poorly on you as a presenter. The good news: we have put together a list of common mistakes and how to avoid them. Depending on your personal computer display and the presentation spaces display the type of adapter you need could span many different brands and models. The best recommendation we have when it comes to adapters, is to ensure you have every possible adapter you could need for your particular presentation device. We also recommend you have backups for your backups as these adapters can easily break or become dysfunctional. As a presenter you do not always know what size of screen you will be presenting on. What that means is that at some point in your career there is a chance you will show up and encounter a screen that is a different aspect ratio from your presentation. In that moment it can feel overwhelming, but it doesn’t have to be. Consider creating all your presentations in a 16×9 aspect ratio. By using this ratio, you ensure your presentation will fit on the screen without stretching regardless of the display ratio. If your display turns out to be 4×3 the presentation software will insert black bars that are hardly noticeable filling the remainder of the screen. One of the worst feelings is the gut-wrenching stress that arises when you open your presentation only to be met with an error that reads “File Corrupted.” For many presenters this is a moment where you sink your head and begin to look for the nearest exit. You ask yourself how am I going to recreate what took me weeks to make in 15 minutes. We are excited to say that all this pain can be avoided by simply tapping in to the cloud and leveraging technology backups. Before heading to deliver your presentation ensure that it is not just saved in the cloud but also saved on a hard drive or flash drive. That way if one file fails you have two more to turn to. 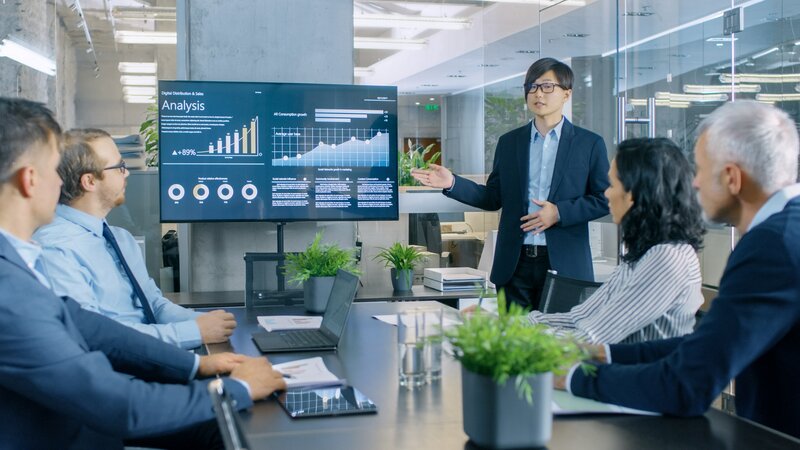 While some of this may feel like common sense you would be surprised how many people fall victim to technology hiccups during their presentations. Capitalizing on the available technology is great, but you must make sure to have backups for your backups so that nothing falls through the crack. And remember this age-old adage “save often.” By doing so you guarantee those great ideas you have make it in to your presentation the first time! At ethos3 we love to help presenters look great on presentation day. Contact us today to find out how we can help you.